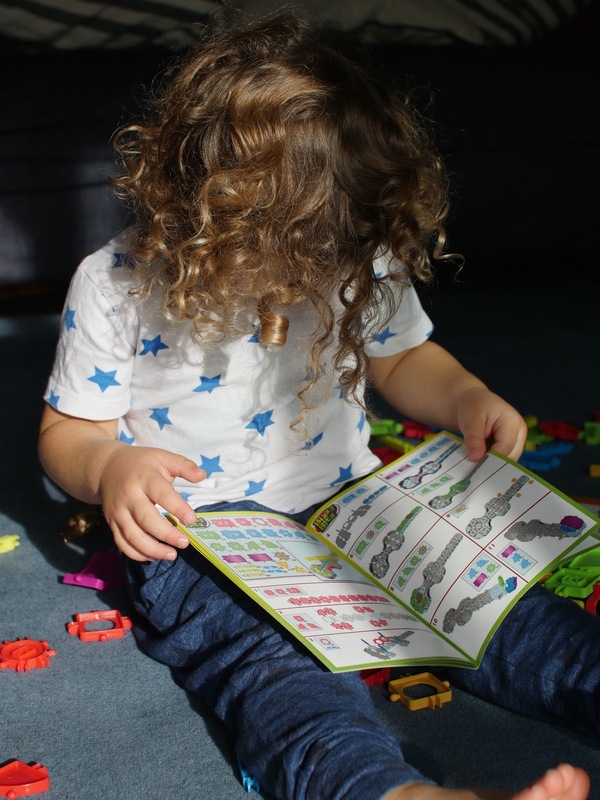 A few weeks back the little ones received a massive box of Bizzy Bitz to try out. I was intrigued I had never heard of it before and was looking for something creative for the children to play with. Bizzy Bitz is a plastic construction toy that can be made into most things. For ages 4 to 8 well I say 8 plus as I enjoyed it just as much as the little ones. We got sent the 350 piece box which contained a number of different leaflets on different things we could made. Ami wanted to make a car and of we set finding the little pieces to make it. I wondered if they may be too small for it but Ami loved it. Son Son on the other hand was more interested in the box than the actual stuff inside. Ami did find it hard to place together at first but when she knew how she was of making her own creations whilst insisting I make the car. After a few attempts and restarting I finally made the car with assistance ( pictured below). This then open a massive can of words as they both wanted a car but thankfully there was enough for me to make another one to stop the arguing over who got to play with the cars. Ami carried on playing for a long time after which is very rare as she often looses interest after a little while. By the time she had finished pieces were over the place and a few prized pieces on the mantel piece for Daddy to see when he got home. I was also "Forced" to make a plane which took me rather long and a few attempts but I did enjoy it. The toddlers love planes and were in awe of my building skills. Ok they weren't that impressed but did play with the plane for a long time. The great thing is that you can build anything that you want. The 350 piece set comes with so many different shapes the possibilities are endless. You could make anything with a bit of creative thinking. Ami also made a birthday cake too, she makes them all the time. The box also comes with five yes five different leaflets to choose from some which have the same things in but a bit of choice. I found them hard to follow at times but got there in the end, my elder son built a handbag from the booklets with no difficulties so must be an adult thing. This set retails for about £38 which may be a little pricey for some but is well worth it. For something that when my nine year old son thought looked babyish he actually enjoyed doing, I secretly did too. I cans see it lasting a long time too (if the bits don't get lost). You can get other sets too all available on the website. It also comes in the handy plastic tub which is super helpful so if doesn't get lost. A great investment for a present for a child, hours of play and a chance for them to be creative and learn though play.